Source: Dallas Denny. 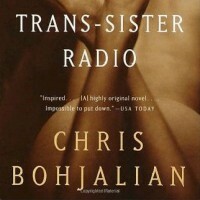 Review of Chris Bojalian, Trans-Sister Radio. (2000, Winter). Transgender Tapestry, 1(92), pp. 52-53. Chris Bohjalian. (2000). Trans-Sister Radio. New York: Harmony Books. If you don’t want to know the plot, close the box! The story line: Dana Stevens, a male-to-female transsexual in transition and a professor at a small college in rural Vermont, has a live-in affair with one of his students, Allison Banks, a sixth-grade teacher in the small town of Bartlett. When Dana begins to crosslive, a public outcry threatens Allison’s teaching job. Will Banks, Allison’s ex-husband and for years the director of Vermont Public Radio, has a skeptical dislike of Dana, but runs a two-day program on transsexualism which is picked up by National Public Radio, with Allison and Will’s daughter Carla moderating. Eventually, under pressure from the community, Dana and Allison break up, and by book’s end Dana and Will have become an item. The story is told in first person, alternating between Allison, Dana, Carla, and Will, interspersed with the supposed National Public Radio coverage, complete with the names of real NPR reporters and announcers. Curiously, although NPR and its employees are named, as are transgender personalities like Christine Jorgensen and Jan Morris, for some reason IFGE, which lives for press coverage, is disguised with the name International Association for Gender Diversity. Bohjalian’s treatment of the transsexual issue, which might be considered sensitive and cutting edge by some, reads like a press release jointly authored by Drs. Shiela Kirk and Stanley Biber—who were, in fact, two of his sources. Dana, within months, transforms from a fairly run-of-the-mill male professor type to a stunning and passable woman who is better at being a woman than natal females like Allison and Carla. Within months, in defiance of the Harry Benjamin Standards of Care, Dana has SRS. Her friends, her lover, and her lover’s family stand by her; her troubles, what few they are, are caused by an ignorant and intolerant populace. Perhaps part of my problem stems from a dislike for Dana, who knowingly enters into a relationship with Allison, abusing not only the student-teacher relationship, but deliberately and cruelly not telling Allison of her impending transition. The latter would be understandable if Dana were as confused and frightened as most of us are at some time in our transgender careers, but Dana is knowledgeable and well-connected and at peace with who s/he is. Under those circumstances, withholding such vital evidence is, while common enough, reprehensible. I would have liked it better if this lack of character had shown itself in other ways, but instead Bohjalian paints Dana as the ever-noble and constantly misunderstood transsexual. I was especially irritated by repeated references to Dana being a woman who happened to have a man’s body, for to me Dana’s behavior seemed to me unremarkably male and sexist even after transition. Bohjalian’s portray of Dana as a sort of superwoman, better than nontranssexual women without halfway trying, raised my feminist hackles. I was also put off by the author’s deliberate distancing of Dana from “Times Square transsexuals,” keeping her comfortably middle-class while giving her the sort of sexuality street trannies are famous for—for Bohjalian paints Dana as alluring, far more than mere mortals; after all, s/he wins the woman; later on, she even wins the ex-husband who had initially disliked her. Certainly transsexuals, even middle-aged ones, can be and should not be ashamed of being powerfully sexual, but Bohjalian takes the easy route by making the transsexual an object of sexual desire, despite this one being middle-aged and remarkably unfeminine while in the male role. Somehow Dana magically transforms within months from a horny professor into a passable, alluring, and sexually magnetic woman, irresistible to both men and women. Not that it doesn’t actually happen at times, but I don’t buy it here. To the unenlightened, Trans-Sister Radio will be a good read. I found the characters cloying, the NPR thread irrelevant and distracting, and Dana’s willful mistreatment of Allison unforgivable. The eventual relationship with Will made the book, to me, no different than any other piece of masturbatory autogynephilic fiction.